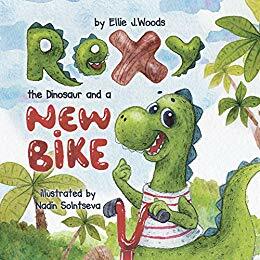 Amazon is offering a free kindle version of Ellie J Woods' book Rexy the Dinosaur and a New Bike. Rexy is a dinosaur who’s very friendly and easily gets excited. His excitement reached an all-time high after his parents bought him a new gift – a shiny red bicycle. Eager to try it out, Rexy put on his helmet and rode around his yard enjoying himself to the fullest. While riding, Rexy encountered his neighbor Trixie. Rexy’s shiny bike immediately caught Trixie’s attention and wanted to ride it for herself. Overly protective with his brand new bike, Rexy refused. He didn’t want to share! Find out exactly how Trixie handled Rexy’s attitude and what influenced him to open up to his neighbor. Did Rexy realize his selfishness shortly after? Did his parents have anything to do with it? What surprise awaited Rexy for showing that sharing is caring?